In the modern world, the cards are stacked against us. From grocery stores filled with foods that aren’t real food, to being bombarded by environmental pollutants in everything from our furniture to the air we breathe and the water we drink, to a culture that takes pride in being busier than ever and wears sleep deprivation like a gold star. When we take steps to recover and enhance our health, we are going against this tide, stepping outside the norm, and it’s not easy! We’re doing it in a world that encourages unhealthy life choices, and sometimes even our closest friends and family try to sabotage our efforts. My guest, Pilar Gerasimo, is a healthcare journalist who has been writing about healthy deviance for decades. 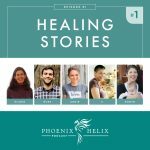 She is the founding editor of Experience Life, an award-winning, healthy-living magazine that reaches more than three million people nationwide. She is the co-host of one of my favorite podcasts: The Living Experiment. And she created a list (and now a mobile app) called “101 Revolutionary Ways to Be Healthy”. Today, we’ll be talking about the obstacles we face and how to be successful revolutionaries for our own health. Gift certificates are on sale for Mother's Day, starting 4/30/17. Use the code MOM for 10% off. Update: due to technical difficulties at POTG, the coupon code doesn't work on gift certificates. So instead, anyone who orders a gift certificate between now and Mother's Day will get a coupon emailed to them for $20 off a future order. The Phoenix Helix Variety Pack has new menu selections for Spring! Added bonus: it's discounted 23%. Pilar actually grew up on a farm and ate a healthy diet as a child. It wasn't until adolescence that things changed – first she went through a disordered eating phase, and then the stress of a fast-paced adult career (founding Experience Life magazine) took its toll on her health. She started developing strange symptoms like rashes, digestive trouble, nightsweats, and bodywide pain that were caused by living a life out of balance and not listening to her body's signals to slow down. The signal that finally got through was when she stomped her foot in frustration one day and actually broke her foot. That was a pivotal moment for her, where she realized she had literally broken her body and had been breaking it for quite some time. It was that moment where she committed to changing her lifestyle to support her health. Defining Healthy Deviance: We have negative connotations with the word “deviance” but it just means deviating from the norm, which is required in the modern world if we care about your health. Over half the adults in the US suffer from chronic illness and 70% take at least one prescription medication. 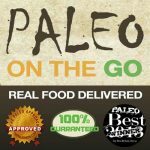 There are so many obstacles to making healthy choices in our society than many people develop a learned helplessness and hopelessness, where they believe change isn't possible. They resign themselves to a lower level of health and vitality. This is the norm. When we step outside this majority and strive to improve our health, we hit resistance. Our choices are noticeably different than those around us, and they are often challenging to accommodate. It brings up a wide variety of psychoemotional responses from those around us, from jealousy to judgment. Healthy deviance makes waves. It helps to acknowledge that it's stressful to step outside the norm. That's the first step to learning the skills we need to navigate this new path and succeed against that resistance. Willpower is a depletable resource, and everything from the media to our food culture is trying to direct us to an unhealthy path. It's not that we lack inner strength when we find it difficult. It IS difficult. That said, it doesn't have to feel like a battle, and we are not victims. Healthy deviance can be a dance – one that over time, we learn to excel at. 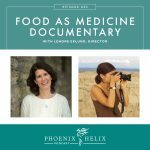 Podcast Ep.53: Food as Medicine Documentary – shows how challenging it is when people first attempt a healing diet in the United States. Podcast Ep. 45: Social Lives on the AIP – advice from people who have mastered this dance. Sometimes all we can do is make it through the day. It's not the time to start new habits or set new goals. Yet resisting the toughest moments in our illness doesn't make those moments any easy to bear. It's counterintuitive, but relaxing and accepting those moments is the healing space. Podcast Ep. 59: The Power of Self-Inquirty with Byron Katie. Amplified Awareness: Being tuned into ourselves and our surroundings, rather than distracted. Noticing when we start to feel tired, upset, reactive, or hopeless. This is when we might feel tempted to make unhealthy choices (and often these are unconscious patterns). Catching these feelings in the beginning lets us be conscious about what's happening and choose healthy interventions instead. Preemptive Repair: Being prepared for the resistance we meet in the our social circles and the world at large when we are healthy deviants. We want to meet these challenges with excellent reserves of energy and resilience. That means getting enough sleep at night and also taking mini-breaks during the day. Continuous Growth and Learning: This is a lifetime journey. There is no finish line where we know everything. Commit to health education being a thread in your life (and not your whole life). Perennial rushing is toxic to the body and mind, increasing inflammation. When you find yourself thinking: “I don't have time; I can't slow down” – stop and challenge that thought. Because our body can stop us cold if we don't listen to its subtler signals to take time to rest and repair. Most of us with autoimmune disease have had this experience. It's not fun. Sometimes this requires re-evaluating our goals and the things we feel we need to do or achieve to be happy. Because often, those goals once met just get replaced by other time-consuming goals and happiness remains out of reach. Create margins of sanity in your daily life: schedule breaks into your day, rather than filling your calendar with back-to-back obligations. Taking time to recover from one activity and prepare for the next takes time. These don't have to be big breaks, but just enough to give you some breathing room (literally). Ultradian rhythms are natural rhythms of up and down energy in the body. We get 90-120 minutes of sustained focus before the body needs a few minutes of rest. If we tune into our bodies, we can often feel this. It's when we start to feel a little tired, or get a little cranky. or have difficulty concentrating. Too often, we judge ourselves for this and reach for food or caffeine to help us “power through.” Instead, if we just answered our body's need with a 5-20 minute rest period, that gives our body a chance to interrupt the stress response and make an anti-inflammatory correction. Think of how beneficial this could be to your health, if you gave yourself “anti-inflammatory breaks” throughout the day. There's also an added bonus: taking these breaks actually makes us more productive. We get more done when we don't try to “power through”. (Resource: The Living Experiment Ep. 7: Pause). Visualization can be a powerful tool for activating the relaxation response, but it can also be the first step toward making healthy changes. Seeing it is the first step to achieving it. 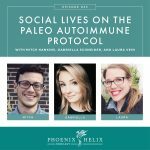 She led us through a 5-minute visualization live during this podcast, incorporating some of her favorite self-care practices: deep breathing, morning practice, ultradian breaks, bedtime wind-down practice, and positive affirmations.